A perennial best-selling Easter board book is reformatted in a low-priced paperback format. In 200 words, this simple book explains a powerful story that even the youngest reader will be able to enjoy. Big, colorful pictures make the story come alive. This wonderful book tells the beautiful story of the first Easter and why it is still celebrated today. - Publisher Ages 4 to 8 years. Here is a book even early readers can read for themselves. Only 200 words explain the very first Easter and why we still celebrate it today. Big pictures make the story come alive. 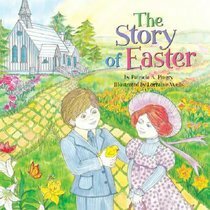 About "The Story of Easter"
Ages 4 to 8 years. Here is a book even early readers can read for themselves. Only 200 words explain the very first Easter and why we still celebrate it today. Big pictures make the story come alive. Patricia Pingry has written nearly fifty successful board books for children. She is widely recognized for her ability to create simple and entertaining stories for toddlers. In addition to her history titles, Patricia has written numerous holiday titles, such as The Story of Christmas and The Story of Easter.